The Korean American Graduate Medical Association (KAGMA) will be hosting the First Annual Korean American Health Conference in Los Angeles on January 16, 2016 Saturday at the City Club LA from 8:30 am-1:00 pm. 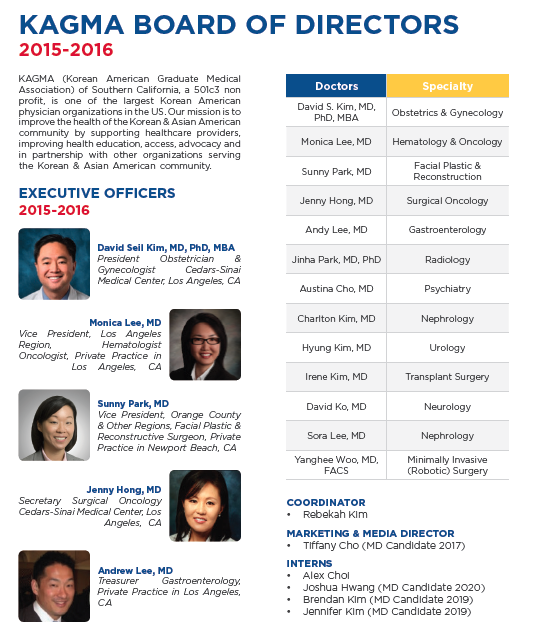 KAGMA, a non profit 501c3, is one of the largest Korean American physician organizations in California, with the primary mission to improve healthcare outcomes in the Korean American and Asian American community. KAGMA’s First Annual Korean American Health Conference....Improving Health Outcomes in Korean Americans through Education, Collaboration, and Empowerment will be the first health conference in Southern California to bring together organizations and individuals who serve the Korean American community in a partnership to improve healthcare outcomes and reduce health disparities in Korean Americans. The target audience will be health care providers and community leaders who work closely with the Korean American community. The conference objectives will be to improve education and awareness in the community of common healthcare issues and disparities affecting the Korean American community and working to develop strategic partnerships to help improve healthcare outcomes.